Just let me be the first to welcome you back. I discovered your site after you went on your hiatus and have enjoyed listening to many of your posts. I do hope another year doesn't pass before the next one! Hi Lefty, it's so great to have you back! I'm looking forward to many more of your posts. 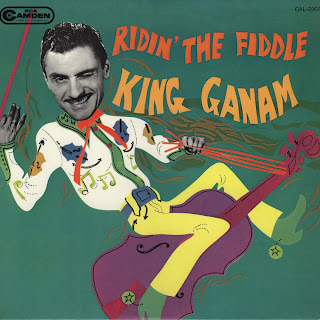 We had the "Ridin' The Fiddle" recording at home when I was a boy. I have always remembered it, and wanted to hear the music again. I don't remember how it happened, but a colleague at work mentioned that he had the record. I brought it home, and in the process of listening, decided to search the internet, and found your blog post, and all the music; and all the information about King Ganam. Great! This is fantastic! King Ganam was a great musician and should be remembered. Thank-you!